← World Cup Penza 2012, 28-29 Apr. Zhenya is in Sofia now, I hope everything will be fine. Zhenya Take care!!! Good Luck in competition!!! Wish You ALL THE BEST!!! Olympic and world champion rhythmic gymnast Evgenia Kanaeva held its formal training in Sofia before the World Cup in Arena Armeec. Russian player missed the race in Penza (Russia) late last week because of colds. But now Zhenya, as her fans call her, more than motivated to provide the level in front of the Bulgarian audience. Although not all of she is given to the training of racing carpet Kanaeva stood smiling in front of home media to share his impressions of our country. – Yes, for the first time in Bulgaria. My impressions are good, beautiful room and the organization level and hopefully do well. – Last week you had health problems, how you feel now? – I do not like to talk about my illness, I hope viewers do not see it and not become evident in my performance.I hope to have many fans here. – What do you remember from the Beijing Olympics? – The Beijing Olympics was the highlight of my life. One of the most beautiful days in my life because every athlete dreams of participating in the Olympics. That was my dream, as is my second dream, to fall for the second time the Olympic Games. I want to wish all here to experience the same. – What motivates you after you’ve already won it? – I do not think about my victories and assessments. I try not to think about it I just think about what I do now and have to think so. I try to please the viewers happy. So I work on myself, trying to cultivate. 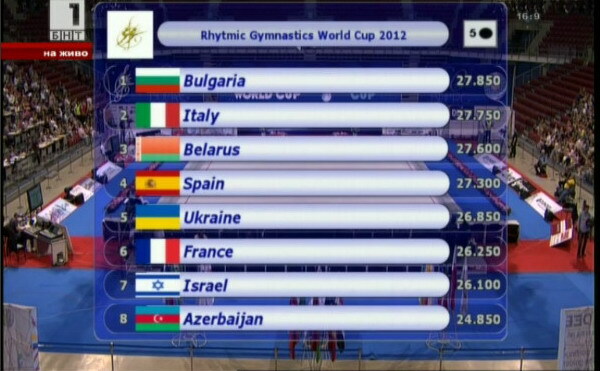 I wish Bulgarian viewers are happy with our performance. Come support us. I wish them health, happiness and get more pleasure from life. 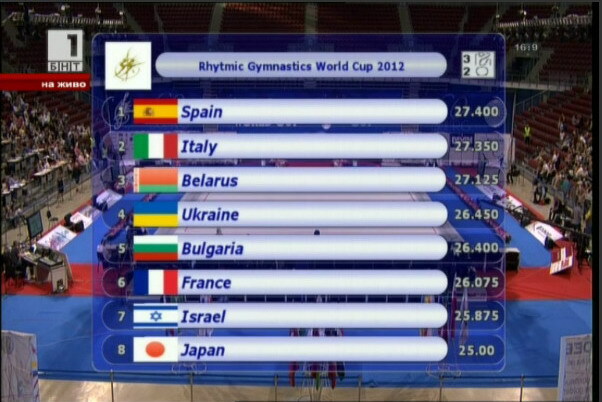 16.00-18.15: junior individual – 2 app. 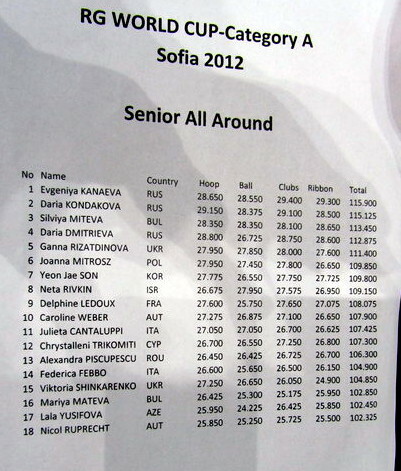 18.30-20.50: seniors individual – 2 app. 10.00-12.15: Junior individuals – 2 app. 12.30-14.45: Senior individuals – 2 app. 14.45-15.00: Dundee Cup, award ceremony, Ind. This entry was posted in Event, Translation, Video. Bookmark the permalink. 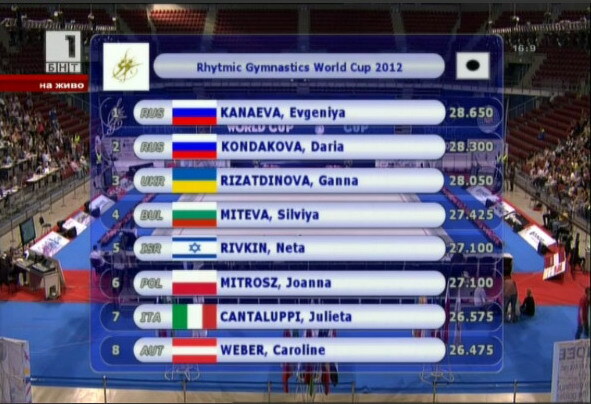 YA Zhenya’s ribbon final, big thanks rodolfocrazybrasil!!! 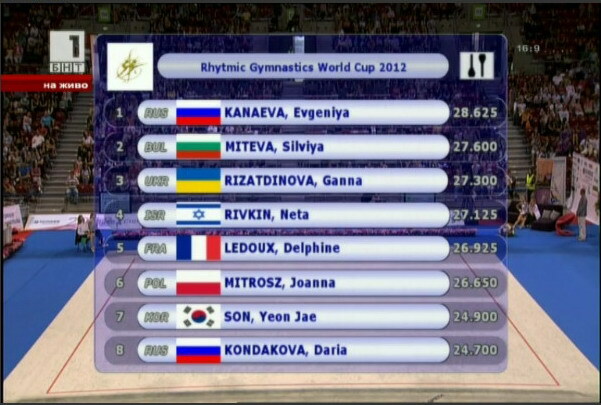 Zhenya’s clubs final, Big Thanks RecintoMoxo2012!!! @StretchyLily, Thank you very much!!! Oops! 😛 Good to know..
Btw, I emailed you some info. @StretchyLily, Rimako Takeuchi is a lady 🙂 and yes her photos are amazing!!! Oh, thank you for letting me know about the Takeuchi book! I really liked the Langsley book photos and text, but I was disappointed that, in a collection that was supposed to show her 35 years of work, she had so few of the great icons of the sport and too many of the up-and-coming ones or overhyped ones. For example: There were a handful of Zhenya, and I recall only a few black and white of Kabaeva and I think only one small one of Tchachina, while there were more than one colour photo of Chrystalleni whats-her-face, etc. I am glad I only paid for the iBook version because the print version is definitely overpriced. After viewing your slideshow, I really hope Takeuchi’s book is available soon again! His photos are much more interesting. Zhenya made mistakes both in hoop and ball :((( Hopefully She will do much well in clubs and ribbon!!! 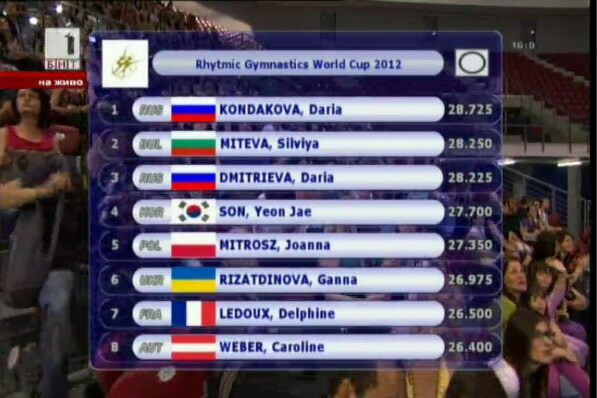 poor Zhenya…I hope she can be better in the other three routines!!! @StretchyLily, Thanks for the information. After watching the preview photos, I think I prefer Rimako Takeuchi’s RG photos book/128pages that was released last year. And its price is much cheaper, the price I bought is around USD45.00 (including shipment). I posted an article about this book last year and uploaded many photos, check here, but this book right now is out of stock. Without special lights, screams, frills, and the usual shimmers, she is beautiful. Lovely. Her beauty comes from the sweat and hard work.